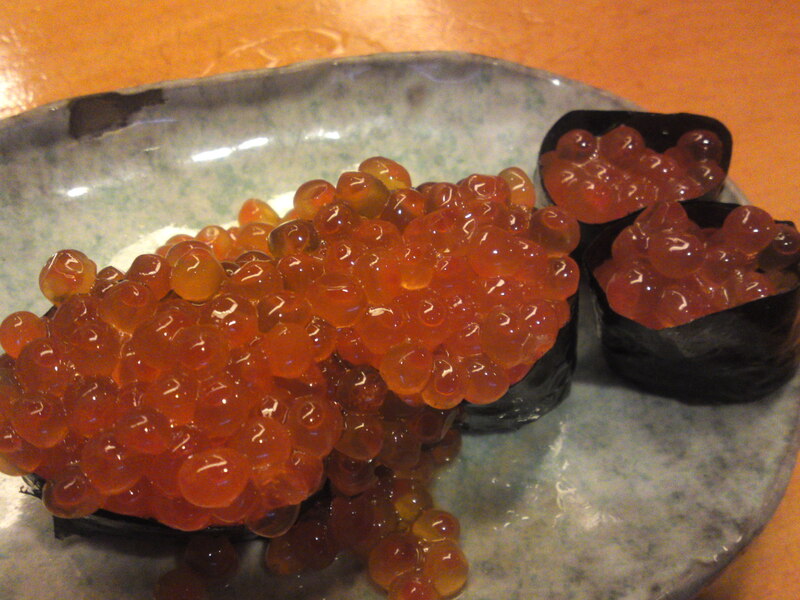 Ikura Gunkan Sushi at Sushi Ko, Shizuoka City, Shizuoka Prefecture. True to say conveyor-belt sushi restaurants (kaiten Zushi) seem to be very popular these days in Japan wherever you are, be it in a large metropolis, a harbor city or a place up in the country. Judging from the attendance and the plorifiration of such establishments, even in cities like Shizuoka renown for its sushi and sashimi in general, one starts to wonder about the wisdom of apparently spending more money on a good sushi place when you have cheap sushi available almost everywhere. Ikura Gunkan sushi at Kaiten Karato Ichiba Sushi, Shimonoseki, Yamaguchi Prefecture (man-made ikura!). I’m not really refering to Tokyo or major metropolises in Japan (neither to New York, London or Paris for that matter) where you either have to spend fortunes on cleverly manipulated “gastronomic sushi” or spend hours waiting overfilled diners machine-gunning leftovers from the local fish markets.
!) Sushi Ko in Shizuoka City where all prices are clearly stated or where the staff will gladly explain the amount of the “day’s value” for some items, especially sashimi. Shizuoka Prefecture is a major fishing area in Japan thanks to the Suruga Bay and Izu Peninsula. 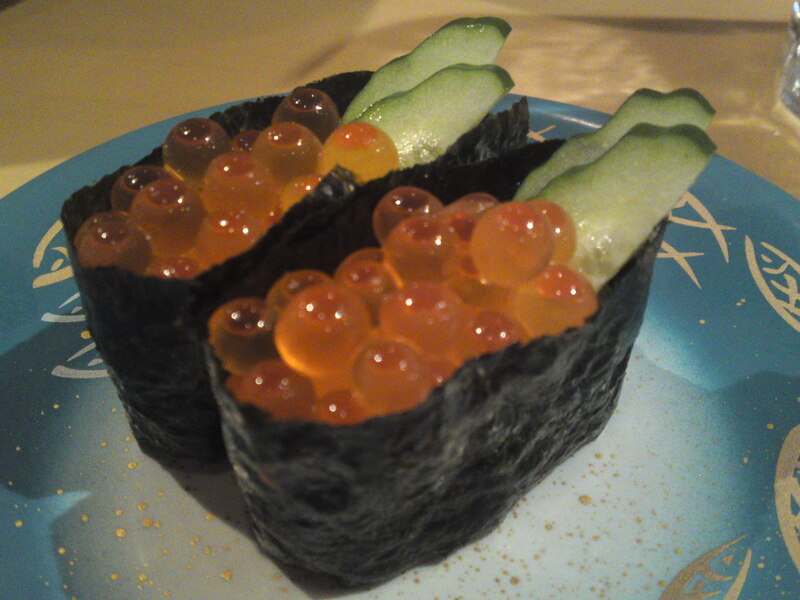 Apart of ikura/salmon’s roe there is no much need to “import” seafood from other shores. 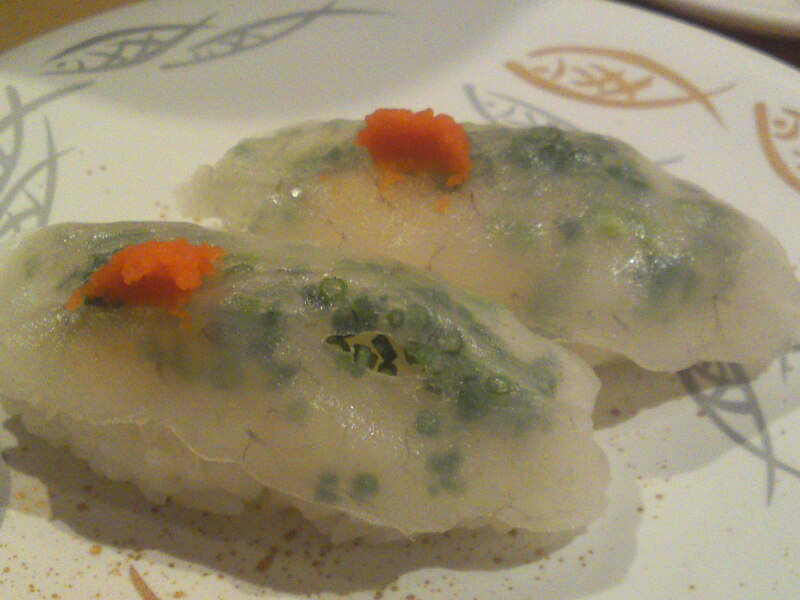 2) Kaiten Karato Ichiba Sushi, Shimonoseki, Yamaguchi Prefecture. Shimonoseki is a major fsihing city and Kaiten Karato Ichiba Sushi is a conveyor-belt sushi restaurant inside the enormous fish market by the sea. You do have to wait at least 30 minutes at off-peak times and the double on holidays. The same applies for the fish supply and ikura! 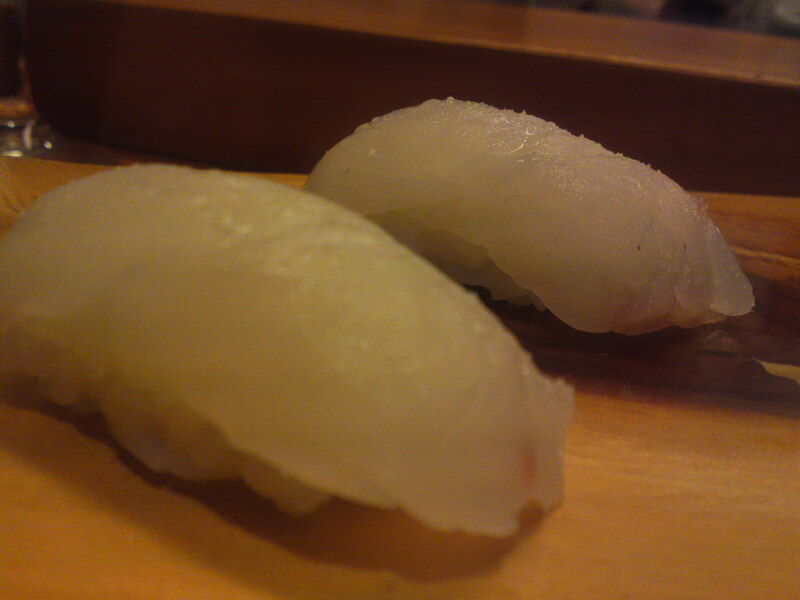 Hirame/sole-grouper nigiri at Kaiten Karato Ichiba Sushi. Now, except maybe if you are a big family and on a limited budget (even so it would be far cheaper and more interesting to organize a “do-it-yorself” sushi party at home! ), would you be ready as an individual or couple to wait untold amounts of time to be finally ushered inside a crowded place sitting elbow against elbow, putting up with the cries of unruly children (or noisy old ladies and gentlemen) and looking at the best bits being repeatedly being grabbed before they rach you? Can you expect attentive service from an overworked staff worrying if the next batch of rice will be ready on time? On the other hand, in a real and decent sushi restaurant with prices clearly advertized you will have the chance to eat at your leisure and if you sit at the counter (where the prices are the same, contrary to the general belief) also benefit from great discusions with the chefs and even your neighbors (good sushi restaurants are great places for socializing with strangers!). Mind you, the same cannot be said from “upper-class” sushi restaurants in great cities where you more than often are obliged to order sushi on a set-menu basis only, and expected to vacate the premises once finished as soon as possible! That is, if you are not a celebritty or an extraordinarily rich individual! So obviously, there is a big difference in atmosphere and service, but would it be enough to help you decide between the two? 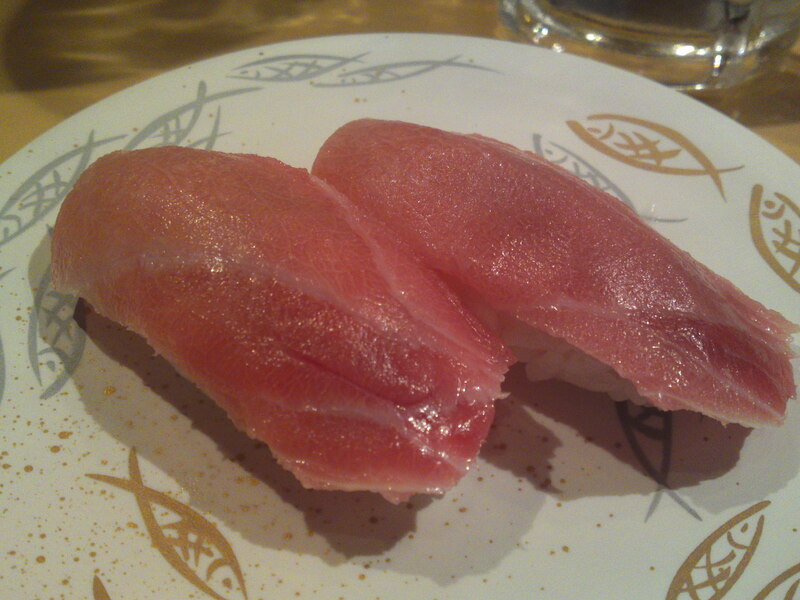 Maguro o-toro (cheapest tuna variety, though) nigiri at at Kaiten Karato Ichiba Sushi. Shall we talk about quality then? First the “shari” or sushi rice: in a conveyor-belt sushi restaurant the nigiri will be made machanically at high speed for obvious economical reasons. It does take a few seconds at a time to form the balls by hands whereas the “chefs” (I’m sorry to say that a chef who cannot make a good sushi ball by hand does not deserve the title of sushi chef!) at conveyor-belt establishments have to learn how to quickly grab the balls spitted out by the machine! Sometimes you may be lucky to eat more or less oval balls, but you will usually end up with hard-pressed squarish contraptions which tend to dry faster. i do not need to point that there is a vast gap in rice quality (and accordingly real value)! You can and are even encouraged to ask for individual orders at kaiten zushi restaurants but the prices will not be the same, so be careful! First don’t expect freshly grated wasabi root in a kaiten zushi (except maybe in Shizuoka which produces 80% of all wasabi in Japan! ), although the paste used contains 100% pure wasabi! Whereas most of the fish will be cut in front of you, chefs at Kaiten zushi will pick up the toppings from stacks prepared beforehand. The latter more than often (especially maguro) will be cut from frozen blocks to attain greater thinness (and better profit). Consequently the fish will appear glossy and fresh but is in fact only in the late stages of thawing. Generally speaking the offerings at conveyor-belt sushi restaurants will be far thinner than those ordered in real sushi restaurants nothwithstanding the difference in grade and freshness, although the latter can be guaranteed in Shimonoseki! Sashimi Plate at sushi Ko: Shirasu (sardine whiting), Katsuo (bonito), maguro (tuna) and kinmedai (Spledid Alfonsino), all from Shizuoka Prefecture! 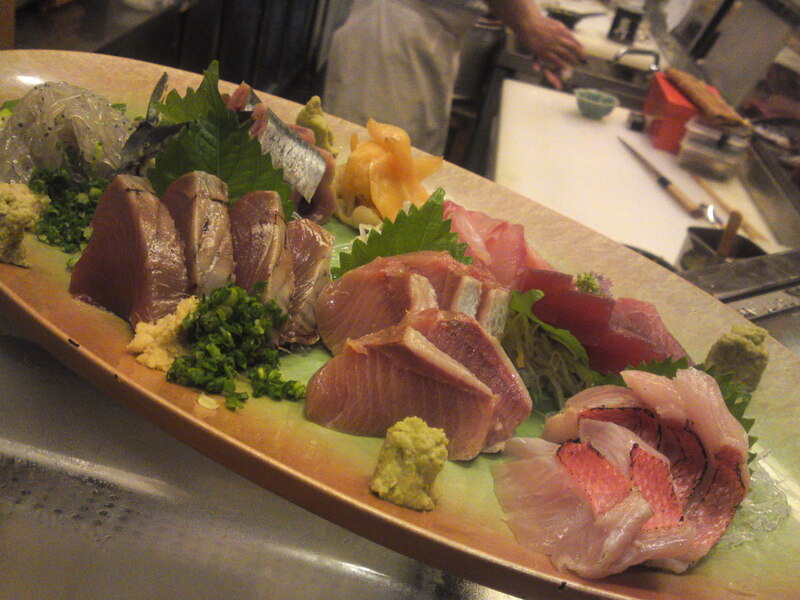 1) a plate of sashimi. 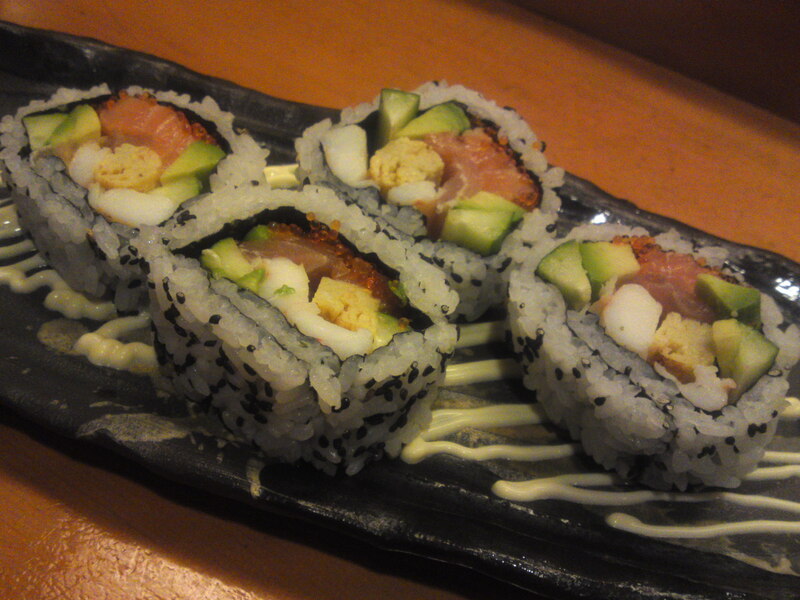 Super California Roll at Sushi Ko! 2) a good quality sushi roll. 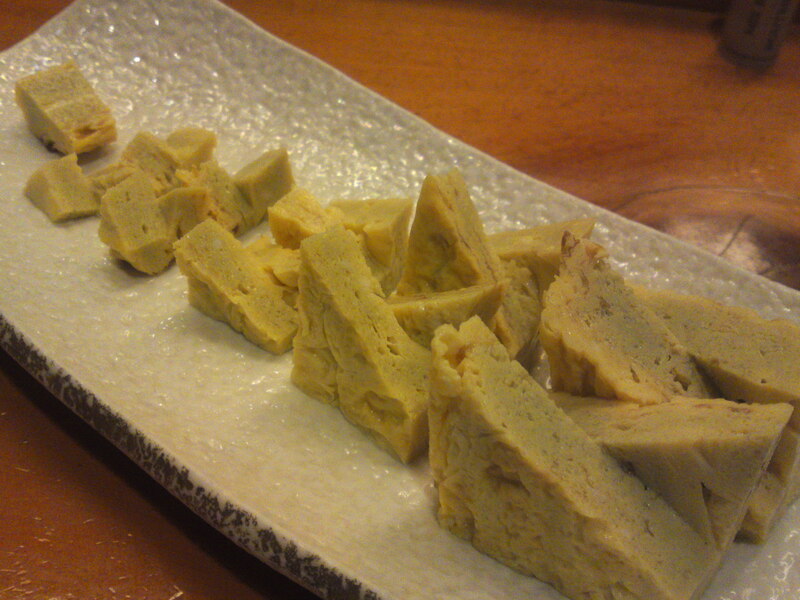 3) a fresh tamagoyaki made onsite. Tamagayaki in conveyor-belt sushi is either prepared and sent in bulk by the company factory in case of a chain, or made on order by a separate company in the case of an independent establishment. Although this is in no way an attempt to coersce people into my view, I prefer to spend a little more money on an occasional visit at a decent sushi restaurant or to prepare my own sushi at home! Preparing sushi rice is no big deal (although the Japanese Missus will not let me to…) and finding decent fish (and vgetables) at a local decent supermarket will guarantee a better quality! 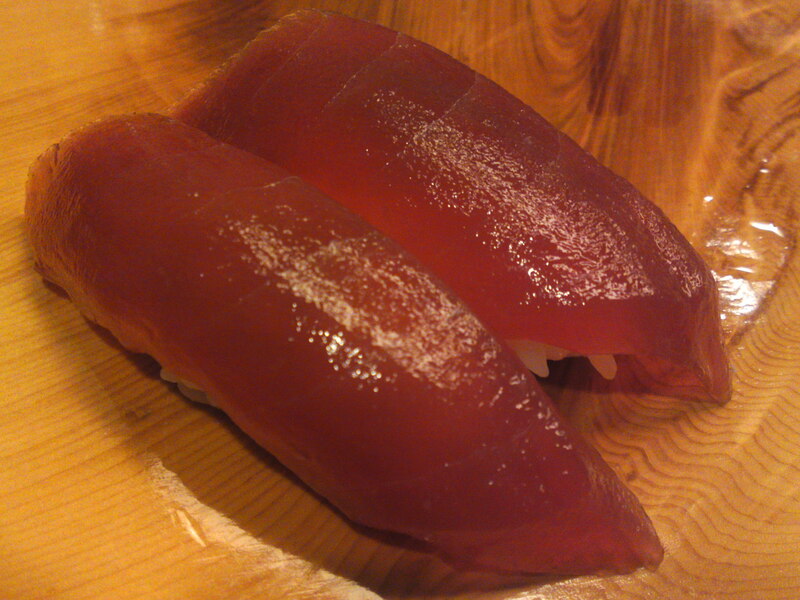 Previous PostSushi in Shizuoka City: Sushi Ko (September 2011)Next PostJapanese Gastronomy: Katsuo Tataki at Waga!